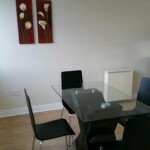 Apartment Refit in Kilmainham Dublin 8, for Letting Agent. 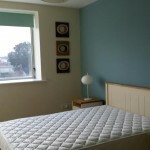 Brief from Client was to renew, modernise and revitalise, making it attractive for potential new Tenants – In a two-week turn around..
Well, how do you tackle a tiered and out-dated 2-bed, 2-bath apartment and make it over it an 2 week period? Here’s how I did it. 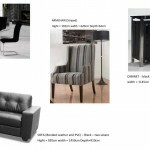 Firstly as there was a lot of wood already in the apartment – as the wood floors were in good condition throughout – I decided that the way to go was not to add any more wood and instead to introduce some sleek black furniture and glass. So my options included feature chairs, in strong light coloured stripes, picking up a sleek black sideboard, tieing in with a modern design black leather sofa, and then a glass dining room table with matching modern chairs… and it worked a treat! 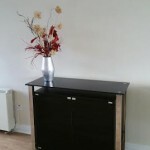 Sideboard - So I started with the entrance creating a modern, sleek and welcoming feel. Using a gorgeous black sleek, slim and modern sideboard. With a high black laquered finish – not only does it stand alone as a feature piece of furniture – it reflects light into the room – and provides all important storage. How good does this look? Building on from the modern and sleek look of the sideboard, I then decided to add a light and crisp glass dining table, with sleek black feature chairs. 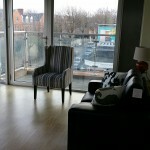 Building on the sophisticated and refreshing modern look that I had envisaged from the beginning. Building on the black modern and sleek look against the wooden floor, we sourced this sleek modern style black leather sofa. 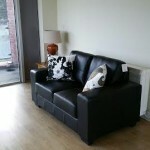 A neutral type sofa that will appeal to both women and men, as potential tenants. Pulling the sleek and modern themes together, I then found these gorgeous feature chairs – perfect for any corner of the room. With lighter tones, the thin black line, brings the theme together. Finally we turned to providing colour schemes for the bedroom. Adding a feature wall of aqua, this builds on the modern and bright theme that is now emerging throughout this bright and updated apartment. Appealing to both sexes, aqua, a somewhere neutral colour, gives immediate appeal to both men and women.